CHARLOTTE, N.C. -- With the start of the new year, Duke Energy is building on the success of popular solar power programs to help more customers go solar across the Carolinas. "Combined with constructive legislation, our programs have solar energy growing in both North Carolina and South Carolina," said Rob Caldwell, president, Duke Energy Renewables and Distributed Energy Technology. "The response from customers has been strong. We expect demand and adoption to grow further as we roll out additional solar programs." The company's $62 million solar rebate program for residential, commercial and nonprofit customers in North Carolina helped 1,700 North Carolina customers go solar last year, hitting capacity limits for both residential and nonresidential customers. Demand has been so strong from residential customers that the rebate allotment has already been met for 2019. The company will continue offering these rebates over the next three years. "The rebate program was a great incentive for us to install a 32-kilowatt solar system on our church in 2018," said Rev. Stephanie Allen of Church of the Nativity in Raleigh. "As a faith community, we seek to be good stewards of our resources – both financial and environmental. Duke Energy's rebate program helped us with both." In South Carolina, the company is in the latter stages of a $50 million solar rebate program that was launched in October 2015. Since that time, the company has added nearly 7,000 private solar customers in the state. South Carolina now ranks No. 2 in the Southeast for rooftop solar connected. 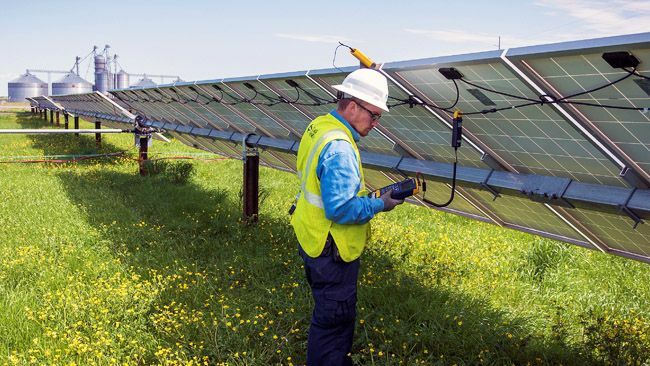 In 2018, Duke Energy connected more than 500 megawatts (MW) of solar energy capacity to the Carolinas' system. Over the past four years, Duke Energy has connected more than 2,500 MW to its grid in the Carolinas, enough to power about half million homes at peak output. This has made North Carolina No. 2 in the nation for overall solar power capacity. Recently, Duke Energy brought online the Woodleaf Solar Facility in Rowan County, N.C. The 6-MW facility is comprised of 30,000 solar panels on a 116-acre site. The solar plant has an innovative tracking system that allows the panels to pivot throughout the day to capture the maximum amount of sunshine. At peak output, the solar plant can power more than 1,000 homes. The future looks bright for other large-scale solar projects. Duke Energy launched a competitive bidding process for new solar capacity last year. The process, being overseen by an independent administrator, seeks to add 680 MW of new solar capacity in 2019 – enough to power about 125,000 homes at peak output. This will ensure the best and most cost-effective projects are built to benefit customers in the Carolinas. A total of 78 projects bid 3,900 MW of solar capacity in the first tranche – with all projects offering energy prices below the company's avoided cost. Projects can be built in both states. Winners will be selected later this year. In 2018, Duke Energy became one of the few companies in the Carolinas to offer solar leasing to commercial customers. A subsidiary of Duke Energy will build, own and operate onsite solar facilities that will allow customers in North Carolina and South Carolina to access renewable energy without paying a large upfront investment. The company also launched its Shared Solar program, with a 7-MW solar facility in Dillon County, SC. Customers who subscribe to solar energy through the Shared Solar program, will receive a monthly bill credit for the value of the energy produced by their subscription size in the facility. The program also has a component for low-income customers. For industrial customers, the company is waiting on approval for its Green Source Advantage program in both states, which will allow customers to secure renewable energy to meet sustainability and renewable energy goals. This "green tariff" provides customers the flexibility to negotiate directly with solar developers to add more renewable energy to the grid, with no cost to other customer classes.